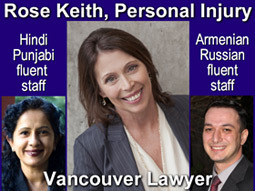 RoseKeith.bc.ca 20+ years in ICBC injury disputes, experienced with soft tissue, whip lash, and traumatic brain injury claims · Medical Malpractice · Employment Law. Home & hospital meetings available. An experienced personal injury lawyer is necessary to ensure you obtain appropriate damages for your injury, care and lost earnings. 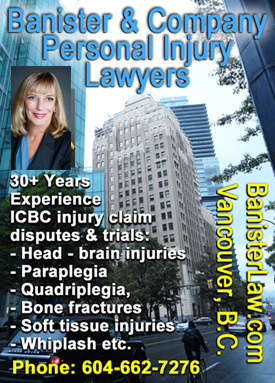 210 - 900 Howe St.
Has over 38 years of experience in I.C.B.C. injury claims. "If you have been in a Motor Vehicle accident involving a motor vehicle, motorcycle, bicycle or if you were a pedestrian, you need an PERSONAL INJURY CLAIMS LAWYER with life experience as well as legal experience to help you deal with your insurance claim. I have been practicing personal injury law for more than 35 years and I perform all services personally without shifting your file to a junior. I am pleased to reduce your stress at this difficult time. Let me handle your insurance claim while you focus on what is most important, namely, your health. It is important to know your rights, to obtain the full benefit of the insurance coverage you have paid for, and to get a fair and appropriate settlement or judgment for the injuries you have suffered. If you choose to retain me, you will pay no fees from your pocket. My fees are a small percentage of your recovery and will be collected from the proceeds of your settlement or judgment. Let me take care of everything for you. I have a long history of success in handling a variety or personal injury accidents and I have had many successful settlements and judgments. 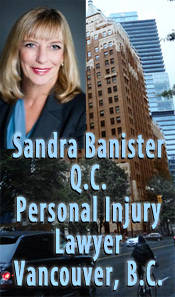 Sandra has 30+ years experience in personal injury disputes against ICBC. She is also well known as a labor & employment lawyer. For more than 25 years, Vancouver personal injury lawyer Z. Philip Wiseman has been helping clients get the compensation they deserve - his team have the experience to help you. We offer services in many languages, including: English, Cantonese, Mandarin, Polish, Vietnamese & Korean. 由Philip Wiseman大律師辦理超過36年豐富經驗、 擅長於辦理個人損傷索償、 同時亦精於辦理汽車意外、 因有人疏忽而導致之滑倒受傷、 以及有關行人、 巴士及的士個案操華語經驗顧陪同律師與閣下豬個案、 查詢請聯絡： Z。 Philip Wiseman Law Corporation曹金芳Kim Tao（ 廣東語） 《 Personal Injury Lawyers》 604-873-8446 Cel： 778-288-5191（ 晚上及周末） ＃ 401-777 West Broadway, Vancouver, BC. Experienced with plaintiffs' only ICBC Personal Injury Cases since 1986. With over 30 years experience as a trial lawyer, Larry Kancs has acted in both criminal and civil litigation matters. Since 1987 he has focused on representing clients who have suffered injuries and losses in car accidents, assaults, slips and falls, faulty products and fires. He has represented clients from many ethnic backgrounds with a wide variety of claims including brain injury, death, fractures, chronic pain, fibromyalgia, depression and soft tissue injuries of all varieties. He has lectured at seminars for the Trial Lawyers Association of B.C. and served on the Executive for that association since 1997. Gordon Zenk, is an avid motorcyclist, with 24 years experience in personal injury, ICBC car accident, motorbike claims, as well as family law. He also has a familiarity with spoken German. Call for a free consultation! Home & hospital visits available. Lianne joined Learn Zenk in 2014, after articling with a sole-practitioner in Victoria, BC. Originally from Winnipeg, Manitoba, Lianne earned her Bachelor of Arts (Honours) in Political Studies from the University of Manitoba in 2009 and received her Juris Doctor from the University of Victoria in 2012. She was called to the Bar in B.C. in 2013. Her practice focuses primarily on Motor Vehicle Accident claims. When she is not in the office, she enjoys rock climbing, running, and traveling. Dil's practice includes: personal injury, ICBC claims disputes, DUI impaired driving, dangerous driving, & criminal negligence driving charges in BC & Washington State. Legal training includes a Master of Laws Degree fr. New York State University. Dil is fluent in English and Punjabi. · McConnan Bion O'Connor Peterson Law Corp.